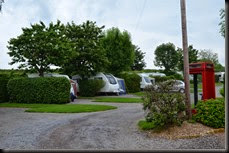 The second half of the Whitsun half-term holiday saw us move from Orcheston in Wiltshire and down to Bingham Grange caravan site near Bridport in Dorset. So, how did we get on? With Bingham Grange only being 60 or so miles away from Orcheston there was no silly o’clock start and it was gone 10am when we set off and the route out of the village was mercifully free of impatient Audi drivers – no offence David! Having previously picked out a route that would take us back around Salisbury and south, heading west at Ringwood, we changed our minds and headed west on the A303, turning off and heading south further west. Trev was doing the honours and all went well until we hit the town of Crewkerne. Some deft clutch and brake work was required as traffic snarled up in the hill approaching. There seemed no obvious reason – no road works, accident or refuse trucks – and it wasn’t rush hour so it may have been just ‘how it is’. Bear this in mind if you’re heading this way. It looked a pleasant enough town though and a good stopping off point for a cuppa and a bite to eat. The site itself was easy to find and there were thankfully no single track lanes to traverse, the site entrance being on the A3066. The entrance was wide and easy enough to spot – but a brown tourist camping sign wouldn’t have gone amiss. Soon after midday we trundled down the road, parked up inn the allotted area and headed to reception. 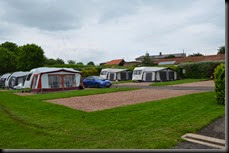 Now, the brave band of souls who have shown considerable resilience read a few of my caravanning blogs will know that we do tend to turn up early at sites and have on occasion been made aware of the wardens displeasure at a pre-midday (or whatever it is) arrival. However we really excelled ourselves this time turning up a whole 24 hours early! Some numpty – er, me – got the dates wrong when booking, but thankfully it wasn’t a problem. The friendly and helpful warden found us a place and we were soon being shown to our pitch. So, what’s the site like? Well it’s privately owned, adults only and comes under the Tranquil Parks umbrella – the same as The Old Oaks in Somerset which is one of our favourites. 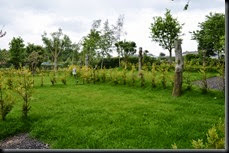 It is well kept – extremely well kept – and is divided into three distinct areas. 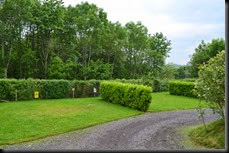 At the front of the park – behind the reception and facilities block are little cul-de-sacs with hard standing pitches, some separated by trees and shrubs. 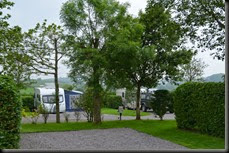 Standard and fully serviced pitches are available, although size does vary (how true, ahem!) so those with bigger ‘vans will not have as much choice. All will accommodate at least an awning to the side. To me this was the prettiest part of the site and a delightful place to spend your holiday. 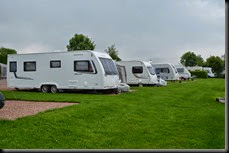 Further down is the more conventional part of the site – two and a bit rows of large hard standing pitches, the top row being fully serviced, the rest with electrical hook up. 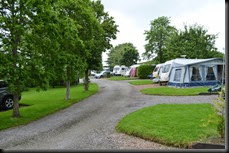 This is where we were situated and judging by the size and set up of some of the ‘vans here, seasonal pitches are very popular. 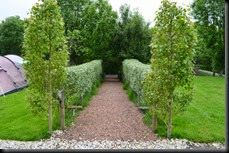 Some pitches were partially separated by low lying shrubs and afforded a degree of privacy. Again, the pitches will accommodate a caravan, with an awning to the side and your car will fit on the front, so plenty of room. The shingle is quite fine though seems quite deep and the jockey wheel found it a little hard going when the motor mover was doing it’s stuff. We didn’t bother with awning so I couldn’t tell you how hard the hard standing was – but plenty of people had. The pitch sloped lengthways but that was easily corrected and thankfully no ramp was required. Beyond this was the tent area and this was delightfully laid out too – clearly a lot of thought – and work – has gone in to the design and construction of this site. 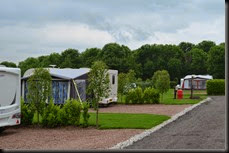 Again, open or more secluded pitches are available and some have electric hook up too. The site totals 111 pitches but didn’t feel too big. A point worth noting is that the electrical hook ups are rated at 10A, rather than the 16A you may be used to on many club sites. Not a drama in the summer but you may need to consider this in the winter when the heating’s on. Beyond the tent area is some woodland and paths from either side of the park take you down there. Dogs must be on a lead when on site but can run free once in the paths once through the gates. All the facilities are contained in the block which houses the reception and shop – which appears to sell just about everything. There are three arrangements for your er, convenience. The are the usual male and female shower/washbasin/toilet blocks that you’ll find on most sites. In addition there are unisex ensuite cubicles at the front and two larger luxurious ensuite units at the back. These have stone slabbed floors, a large showering area and are stunning. Sadly whenever I went near one with the camera they were occupied – but I can tell you they were lovely to use. There’s a laundry room with washing up facilities – but we never went anywhere near that – and an information room and above the whole lot is a bar restaurant called Buzzards. More of that later. Back at the ‘van, TV reception was excellent – and we didn’t have to raise the aerial or twiddle it. Mobile reception – at least for our networks – Virgin & Three wasn’t great and mobile internet was barely usable. Voice calls were just about ok. Wi-Fi is available and starts at an eye watering five quid for a day – to a more reasonable tenner for a weeks access. Signal strength was adequate where we were and it rarely dropped out. Anyway, enough of that for now – back to the trip. So, having already noted that the bar opened at six pm – and it was still some way off that – we headed out for a look around and a bit of ‘research’. We came across one pub that was just opening up, but was in the process of being redecorated and we only stopped for the one. Back towards the site, the signpost at a crossroads indicated a couple of watering holes not too far away. We decided to investigate. Well, we drove for what seemed like a week, through some extremely narrow high banked winding roads and I think the car barely made it out of second gear. We eventually came across the first pub. Which was shut. Backing up we followed the signs for the second one and after another millennia found it – yes it was open – but not until six pm. Christ! We headed back to the site having achieved nothing more than wasting an hour or so of time and a gallon or so of diesel. Ouch. It was nearly six by the time we got back and we weren’t the only ones queuing for the bar. It opened promptly and we all went in. It was nicely laid out with the bar at the end – and the kitchen behind – and tables laid out for casual or more formal dining. i.e cutlery and white table cloths. There was no real ale but six taps offer the choice of two ciders, two lagers and two bitters. Impressive. 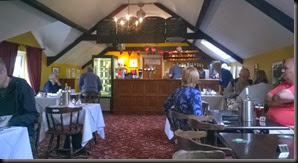 The menu offered traditional pub grub with light bites and vegetarian and fish options on the regular menus as well as daily specials catering for all palates. 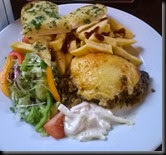 The food itself was excellent – lasagne for me and a burger for Trev. It was ‘home’ made and tasted it. Portions were good and well presented too. All in all, very enjoyable. It’s a great addition to the site, particularly when you are not within walking distance of anywhere else. You can pre-order and take away you food – and plenty of people were doing this, but there were plenty enjoying the ambience too. Both grub and grog was fairly priced and this is to be commended and I’m sure contributes to it’s success. I would love to see more sites – particularly remote ones – offering something similar. It opens five or six nights a week depending on the season and Sunday lunchtimes too, when booking is recommended. We were to visit again before the week was out. Wednesday saw a long lie in and an eventual visit to West Bay and Bridport. 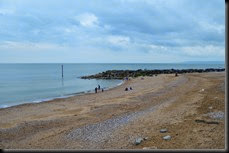 We’d passed through both – briefly – on our visit to Dorset in December 2012 and was glad of the chance to have a longer look – particularly at West Bay. A harbour area with plenty of the usual sea side amenities awaits you as you arrive and a lovely very fine single beach is easily accessible with cliffs rising either side, both of which have well used walking tracks. The one to the west provides excellent views to Lyme Regis on a nice day – apparently. Sadly it was largely grey and overcast so we didn’t bother to climb up and find out. That’s the only reason. Honest. 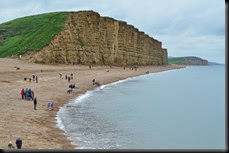 The cliffs to the east will be recognisable to fans of the popular ITV drama; Broadchurch. The scenes where the body was found at the start were filmed here. They provide an impressive and dramatic back drop. 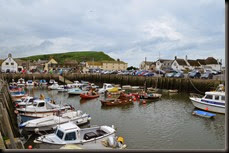 We lingered for a while, taking coffee and a snack in a cafe overlooking the harbour before a brief traverse of Bridport’s high street on the way back to the site. Buzzards, the site bar & restaurant didn’t open Wednesday night so in the evening we set off again in to the undergrowth emerging several weeks later in to the village of Powerstock, and more importantly the car park of the Three Horseshoes. The view from the car park was lovely and we could have enjoyed the same view from the beer garden had the weather allowed. But, being Britain, it didn’t. The beer was good, reasonably priced compared to what we’re used to – although to a northerner probably extortionate – and the food was excellent although probably at the top end of what you’d expect to pay in a boozer. Thursday saw us up early and heading cross county to Swanage. This is one of our favourite places with a lovely beach, promenade, pier and town. We’d been before back in our previous trip to Dorset, in December 2012 but had planned to meet up with friends for lunch who were staying in Bournemouth. Well, we had a lovely day, great weather and great company and a tasty lunch to boot. A ‘must-do’ for the next visit is a trip on the Swanage steam railway to Corfe Castle. Had I had my camera with me we may have been tempted as I bet the countryside and views are lovely. We arrived back at the site just before six pm, the time the on site bar; Buzzards opened. What a coincidence. Chilli for me this time and bangers and mash for the Portly Partner, both of which, were again excellent. Friday saw another lie in then a slow day of tidying up, packing up and doing a few odd little jobs around the van. In the evening we headed in to Dorchester to meet up with some more friends – yes, we have more than a couple – there’s some tolerant people around – for a meal. We first met Samantha & Andy at Twittercamp in March and were looking forward to hooking up again. We were early of course, and while the temptation was to dive in to the nearest pub and get stuck in we erred on the boring side of sensible and went in search of a cuppa. It’s fair to say, options were limited at 7pm on a Friday night in Dorchester with Costa seemingly the only – and frankly unappealing option. However we eventually came across a vintage an antiques shop with tea rooms above going by the name of Reloved. Although they’re were expecting a party for an evening meal they were happy to accommodate us and I’m glad they did – what a fabulous place. The tea – served in bone china was lovely and the cakes looked divine too. I had to call on all my reserves of will power – needed only when refusing a pint – to resist. 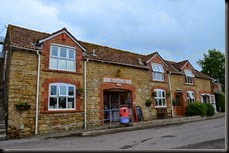 The dining venue of choice of our friends was a pub called The Blue Raddle, a few minutes walk away. And what a choice too. Again, the grog and grub were good and the chat flowed. A great choice of real ale and some real tasty traditional pub grub. Thank you again both of you for a thoroughly enjoyable evening. And that, really is that. Another one done. A couple of great sites, completely different to one another but both very enjoyable. In terms of getting out and about sightseeing it certainly wasn’t our best, but on the plus side it was great to catch up with friends for a chat. Well, Trev chatted while we listened. Some of the time anyway! There’s just four weeks now to the end of term and the start of the summer holidays – for us anyway – one of the benefits of working at a private school. Ireland beckons. Until then….